9:15 AMHOLLYWOOD, California — Director Ryan Coogler stood onstage next to Marvel film executives, microphone in hand, and introduced his cast of Black Panther one by one. He could barely get his first welcoming words out before audience members leaped to their feet to give him a standing ovation — the first of several throughout the night at the film’s world premiere at Hollywood’s Dolby Theatre — an event almost unheard of, even at a place designed to celebrate such an accomplishment. No one knew as he was bringing out his cast whether this film was any good. What they did know was that this was a moment. When Sterling K. Brown stood onstage after his introduction, he raised one fist in the air with the kind of conviction that Olympians Tommie Smith and John Carlos did on the Olympic podium in Mexico City almost 50 years ago. It was yet another moment when the crowd erupted into applause, and again, the first credit had yet to roll for the film. But this was a celebration. And most of black Hollywood, along with notable Hollywood dignitaries, was there to witness. Last time a Hollywood theater was this jam-packed, there was surely a lightsaber involved. There was no bad seat in the Dolby Theatre. 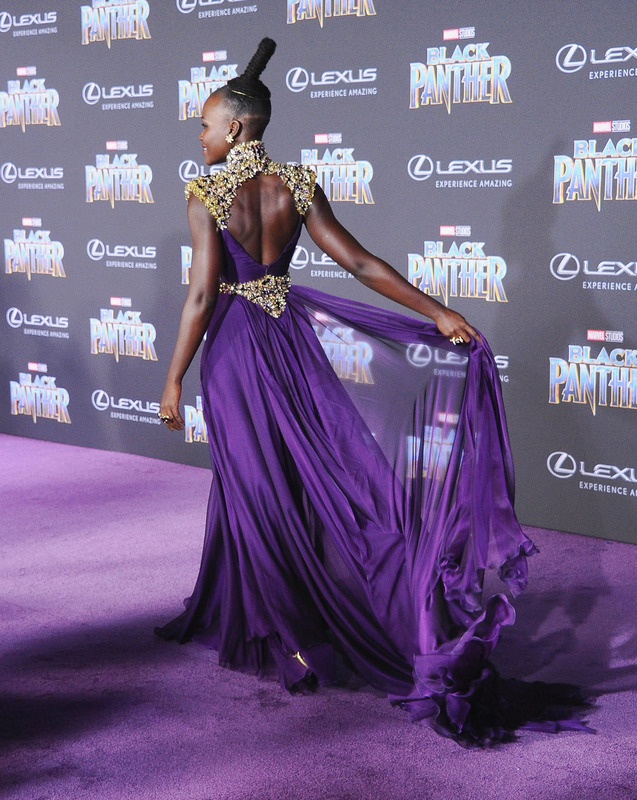 On the main floor, people such as Jamie Foxx, Donald Glover, Kendrick Lamar, Snoop Dogg, Janelle Monáe, Reggie Hudlin, Lena Waithe, Usher, Yara Shahidi, Elizabeth Banks and George Lucas sat among the film’s stars, who included Chadwick Boseman, Michael B. Jordan, Lupita Nyong’o, Danai Gurira, Daniel Kaluuya, Letitia Wright, Winston Duke, Angela Bassett, Forest Whitaker and Andy Serkis. Lupita Nyong’o attends the Los Angeles premiere of Black Panther at Dolby Theatre on Jan. 29 in Hollywood, California. Up in the mezzanine sat notables such as director Ava DuVernay and actors such as Tessa Thompson, Issa Rae, David Oyelowo, and many, many others who all gathered to watch the film they’d been waiting years for. Finally, that day is here — for the lucky ones. Fans crowded the red carpet before the Dolby Theatre on Monday night just to get a glimpse of the cast (and their famous admirers) as they posed and did celebratory victory laps. As per usual, with a film of this magnitude, mobile phones were bagged and placed into security bags before anyone was allowed inside. Last time a Hollywood theater was this jam-packed, there was surely a lightsaber involved. This crowd, of course, is most certainly the blackest premiere crowd for a film of this magnitude. A rousing cheer went up in the theater just as the lights were dimmed, and by the time Coogler’s epic story of the Black Panther’s homeland, the fictional African country of Wakanda, was done, the applause and cheers were even greater. It’s a moment, and it’s a moment that was witnessed by some of the biggest giants in the industry. We’re not allowed to offer up plot points or spoilers — fans wouldn’t want that anyway! — until an official review embargo is lifted: It’s set for Feb. 6 at noon EST, but we can tell you that the film is quite magical. And very authentically black — both in nuanced ways, and overtly — and, importantly, it’s very, very good. It falls right in line with what we’ve come to expect from Marvel productions. And as the even luckier ones who attended the screening poured into the Hollywood Roosevelt across the street, wrists draped in hot pink bands signaling they had entrance into the intimate after-party, the celebration continued. Directors F. Gary Gray and John Singleton and producer Kenya Barris were among the crowd feasting on turkey meatballs, mac ’n’ cheese and sweet potato fries as tunes by Mary J. Blige, Chubb Rock, Bobby Brown and Bruno Mars soundtracked the night. By the time Frankie Beverly and Maze’s “Before I Let Go” dropped, the party felt every bit of a backyard boogie. Folks such as Meagan Good and her studio executive husband DeVon Franklin were among the last to trickle out as the after-party came to a close around 1:30 a.m. And even then, no one really wanted to go home and end the night. 12:59 PMBlack Thought, the legendary rapper and front man for the equally legendary Roots crew, takes a break from discussing his hometown Philadelphia Eagles. Like most people in a Gramercy Theater VIP section during the wee hours, the Super Bowl is a hot topic. But Black Thought soon starts talking about music’s Super Bowl — the Grammys, in particular, music’s role in a documenting this period of life. It’s a conversation that has been a constant theme of Grammy weekend — realizing the moment and embracing generational responsibility. Hours earlier, at the red carpet day party thrown by the American Society of Composers, Authors, and Publishers (ASCAP), the songwriting organization made up of more than 650,000 writers, composers and music publishers, the conversation was much the same. Drinks flowed like the Nile at New York’s Standard High Line as DJ D-Nice soundtracked a breathtaking view of the Hudson. Selfies nearly outnumbered hugs and laughs. But tones shifted to a more prideful, even stern demeanor when people spoke individually. 10:29 AM“We the young kings of hip-hop right now,” said Quavo. He was laughing, and playful. Yet serious. Their new album, Culture II, had hit all streaming services less than 24 hours before. The 24-track double album boasts verses and production from Drake, 2 Chainz, 21 Savage, Big Sean, Metro Boomin, Mike Dean, Kanye West and more. The group is up for two Grammys Sunday night: best rap album, 2017’s Culture, and best rap performance by a duo or group for the monster hit “Bad and Boujee.” But it made a weird kind of sense that the first time Migos (whose “Stir Fry” is the official song of NBA All-Star Weekend) spoke on Culture II, it would be in an intimate setting. One doesn’t just see Harlem, New York. You feel Harlem. You smell Harlem. You vibe with Harlem. From the backseat of a Lyft, you pass the stalwarts of the community — the Duane Reade pharmacies, General Grant Houses, the countless delis — many of which will sell you a delicious “chopped cheese” sandwich — if you’re hip on how to order them. Black Panther promotional posters adorn nearly every bus stop, it seems. Even as the gentrification of the Harlem becomes more and more entrenched, the spirit of Malcolm X lives on in the creative, cultural and social melting pot where he stood as a titan on its street corners, and died as an icon. 10:09 AMThe vibe was old-school glamorous New York last night for the Essence 9th Annual Black Women in Music event. Missy Elliott was honored at the jam-packed Highline Ballroom, and phones were in the air as none other than Janet Jackson surprised Elliott with a truly emotional speech, and presentation of the award. “Some rhyme, some rap, some act, some choreograph, some write hit songs, some create whole new sounds,” said Jackson. “Some women are able to make [their] mark in some of these fields. But there’s only one woman who has made her mark in all of these fields…Not only have you made your mark, but she’s done so with boldness and courage.” Love & Hip Hop empresario Mona Scott-Young also spoke on behalf of her client and friend Elliott. The Plug, ‘Awards Season: Jemele Hill’ (Episode 7): Who’s the Best of the Best?